The Kent County Road Commission is dedicated to being a good steward of the environment, balancing efficient practices that help to keep the motoring public safe with responsible use of materials that aid our efforts. The following provides environmental resources related to the right-of-way and opportunities for residents to support our storm water management efforts. A watershed is an area of land that catches rain and snow and is drained by a system of wetlands, streams, lakes, ponds, and rivers. The Grand River Watershed is the second largest drainage system in the State of Michigan, second only to the Saginaw River Watershed in size, and comprises 13% of the entire Lake Michigan drainage basin. The Grand River watershed has a drainage area of 5,572 square miles (14,431 square km) and it drains portions of Muskegon, Newaygo, Mecosta, Montcalm, Gratiot, Ottawa, Kent, Ionia, Clinton, Shiawassee, Barry, Eaton, Ingham, Livingston, and Jackson counties in Michigan. The elevation of the watershed ranges from 1,260 feet (384 meters) in the uplands to 577 feet (176 meters) at its mouth. The river basin is approximately 135 miles (217 km) long and 70 miles (113 km) wide. Please ONLY RAIN in the DRAIN! 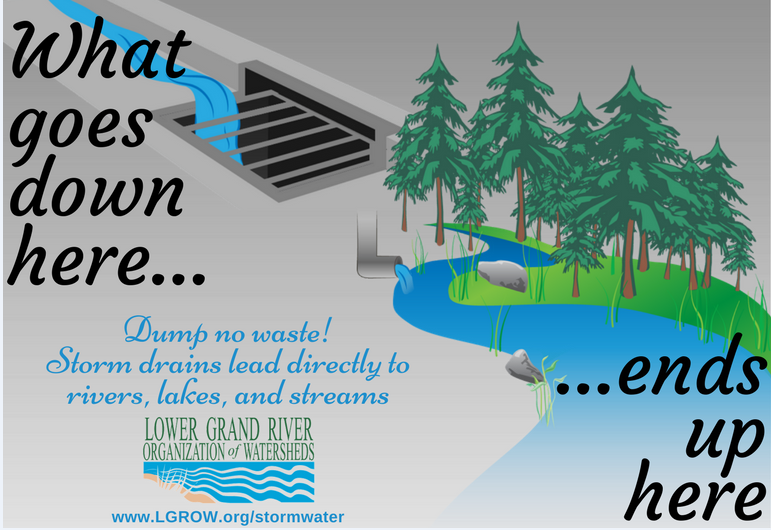 Report ANY dumping into storm drains, streams or other water bodies to Kent County Road Commission at 616-242-6900. 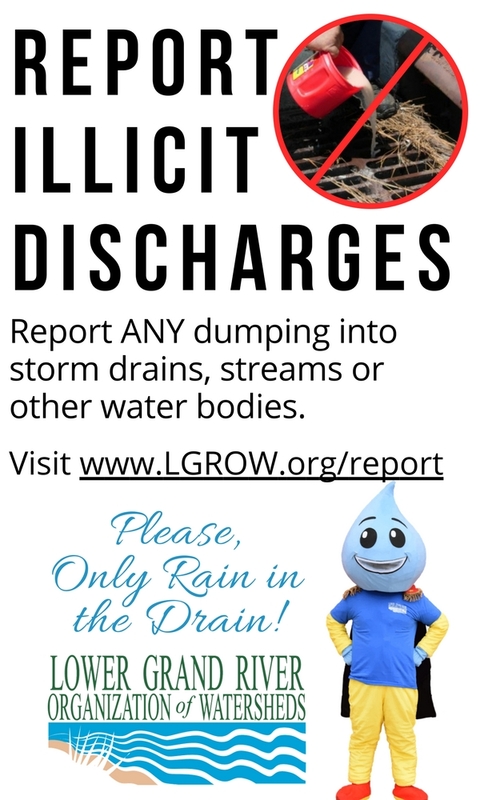 To report illicit dumping in the cities and villages of Kent County outside the road commission's jurisdiction, please visit Lower Grand River Organization of Watersheds. Reduce stormwater by planting rain gardens and using rain barrels in your gardens to prevent water from leaving your property. Keep storm drains near your home clear of litter by disposing of trash and recyclables in proper containers. Collect yard waste to prevent grass clippings and leaves from clogging the storm sewer system. Avoid fertilizing your lawn before a rainstorm, use only manufacturer's recommendations, and sweep up excess fertilizer on hard surfaces like sidewalks, driveways, and roadways. Ensure that soiled water and other wastes from car washing practices do not enter the storm sewer system by washing your car on grass or gravel, rather than your driveway. Better yet, take your vehicles to a commercial car wash that sends wash water through the sanitary sewer. Be septic smart! Keep your septic system maintained to protect your family's drinking water and reduce the risk of contamination local water. Properly dispose of any pet waste in a closed trash receptacle. Pet waste is raw sewage and contains harmful bacteria, easily transported to water through stormwater. Be conscious in closing lids on dumpsters and outdoor trash cans.